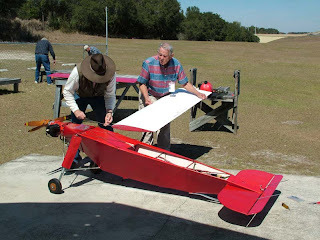 Jay McMullan's RC Aircraft Blog: WWII UAV Flies Again!!! One of the great things about flying radio controlled aircraft are the people you meet. I was out at our flying field a couple weeks ago and met Norman Smith. He told me he has a World War Two era drone that flies. I have seen one of these at the PIMA Air and Space Museum in Tucson, Arizona. I was surprised that any are still flying. He told me that he has Don Lowe or someone else fly it when it does fly. I asked him to call me when he got ready to put it up. Well, Monday March 1, 2010 I got the call. Norm said he would be at the field in about an hour. I had gone out the previous Friday and Saturday to fly and my back needed some rest but decided I really didn't want to miss seeing this piece of history fly. 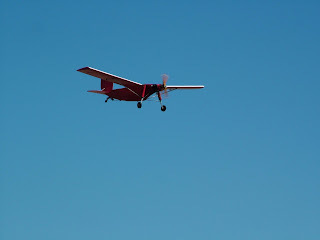 I got out to the field and Norm and his friends had the plane put together. 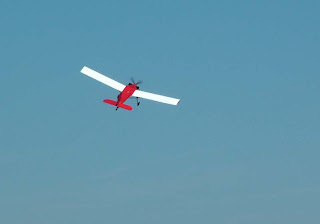 The plane is large, something like a 12 foot wingspan and it weighs in at 79 pounds which, to fly, the Academy of Model Aeronautics (AMA) requires a special waver. Once the plane was together, a check list was reviewed just like with a real airplane. The plane has a twin cylinder engine with counter rotating propellers. When the check list was completed, the radio was checked for range and then the airplane was taken to the end of the runway. Don told me that the plane takes a lot of room to get off the ground. The plane is also just three channels with no ailerons but ample dihedral so the rudder works well for turning. With Don Lowe at the controls, Norm started the large engine. Jim Lackey held the plane on the runway until Don was ready, then let go. The airplane barreled down the run way and lumbered off toward the end. 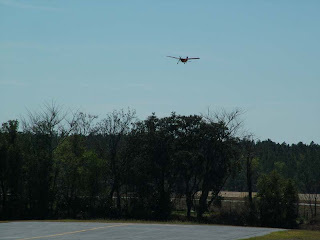 We have a 710 foot paved runway so it took a little while to get it in the air. Once in the air, the plane flew slowly but was quite a site to behold. 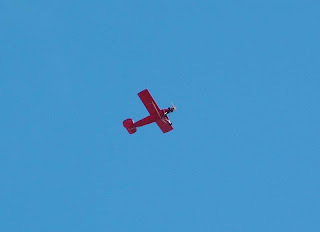 It was amazing for me to see this airplane fly and to think that they used these for target practice in World War 2. Thanks to Norman for taking such good care of a great piece of our American History! 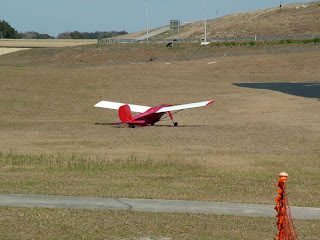 Click Here to read about the RadioPlane. Fantastic Jay, thanks for posting.